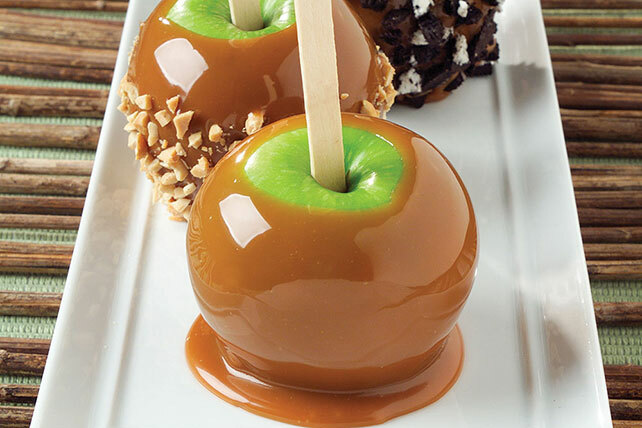 Watch our video on how to make Caramel-Dipped Apples. While they've long been a staple of county fairs, these Caramel-Dipped Apples can be made at home! Insert wooden pop stick into stem end of each apple. Microwave caramels and water in large glass microwaveable bowl on HIGH 2 to 2-1/2 min. or until caramels are completely melted and mixture is well blended when stirred. Cover large plate with parchment; spray with cooking spray. Dip apples, 1 at a time, into caramel sauce, turning to evenly coat each apple. Hold dipped apple over bowl to let excess caramel drip back into bowl. Prepare using KRAFT Caramel Bits.